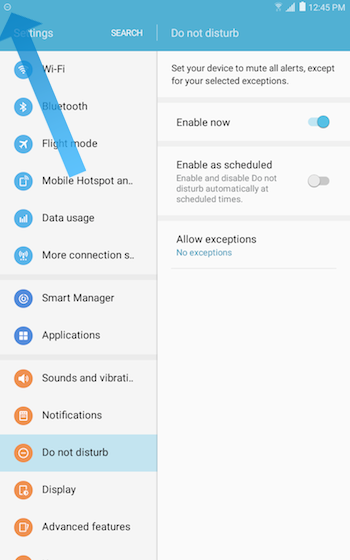 What is the Do not disturb feature, and how do I use it on my Galaxy Tab E LTE? 3. Touch Do not disturb . 4. 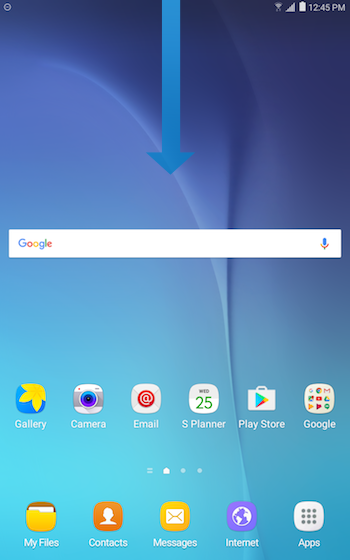 Touch the slider next to Enable now to turn Do not disturb mode on . 5. When Do not disturb is active, a specific icon is displayed on the top left corner of the screen. 2. Touch to open the Quick Settings Panel. 3. 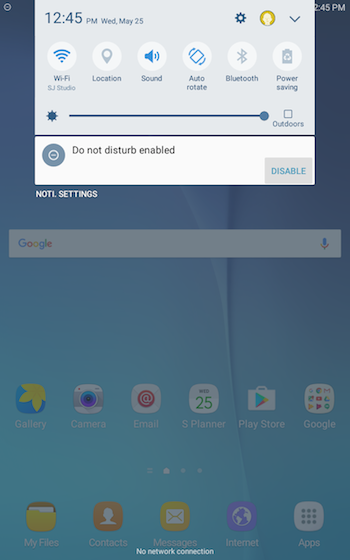 Touch Do not disturb to turn on the feature. 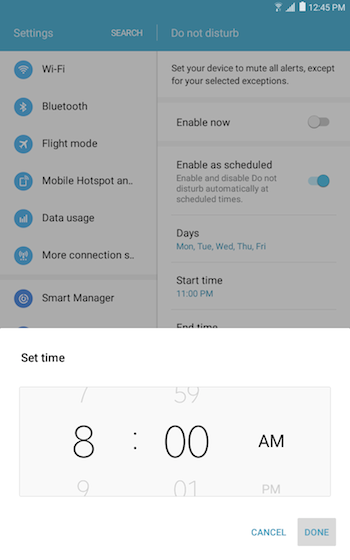 Note: If alarms are not set as an exception, Do not disturb mode will silence all alarms set on your device. 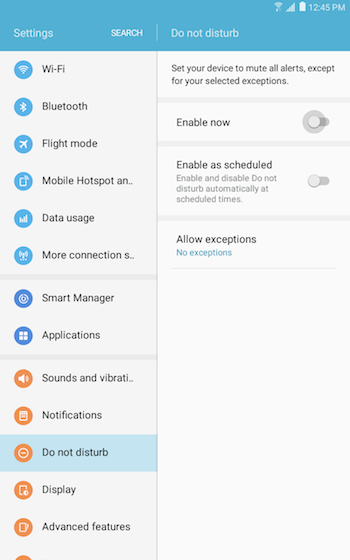 If you want to receive notifications from certain apps when Do not disturb mode is turned on, you must set these notifications as exceptions. 5. 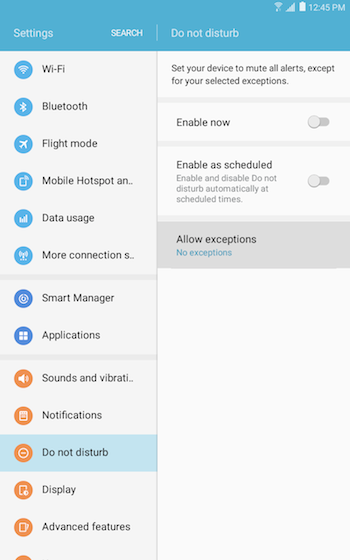 Choose whether to allow No exceptions, Alarms only, or Custom. Note: We strongly recommend you to choose Alarms only or Custom. 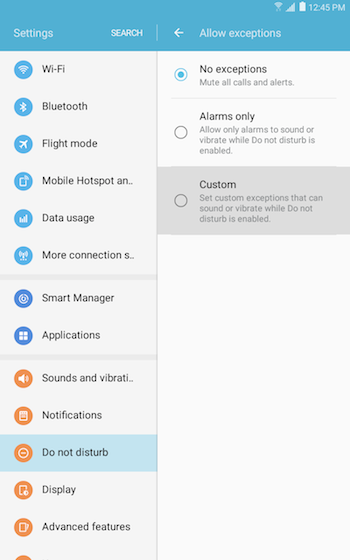 • Alarms: Allow notification sounds and vibrations for alarms. 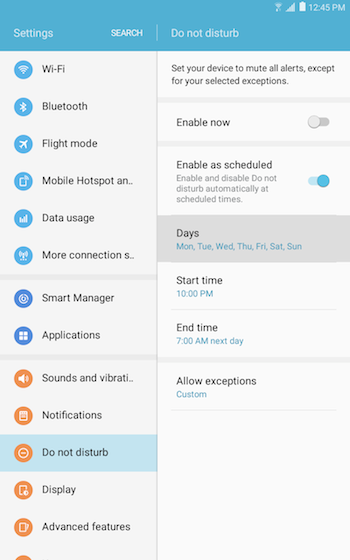 This feature will be turned on automatically. We strongly recommend you to leave this option activated. • Repeat callers: If you receive more than one call from the same number within 15 minutes, the call will be allowed to ring. • Calls from: Choose whose calls will cause your device to play a notification sound or vibrate. Select All, Contacts only, Favorite contacts only, or None. • Messages from: Choose whose messages will cause your device to play a notification sound or vibrate. Select All, Contacts only, Favorite contacts only, or None. 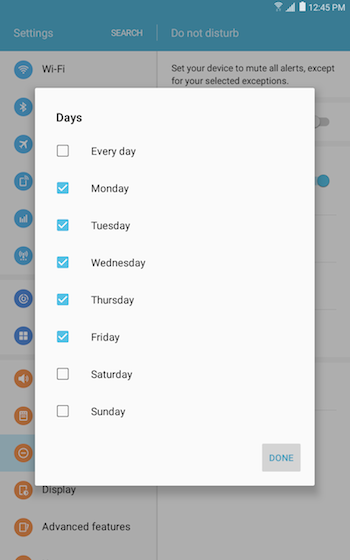 • Event/task alerts: Allow notification sounds and vibrations for Calendar events and tasks. • Reminders: Allow reminders from applications that support them. • Priority app notifications: Touch the slider next to each application you want to turn on as an exception. 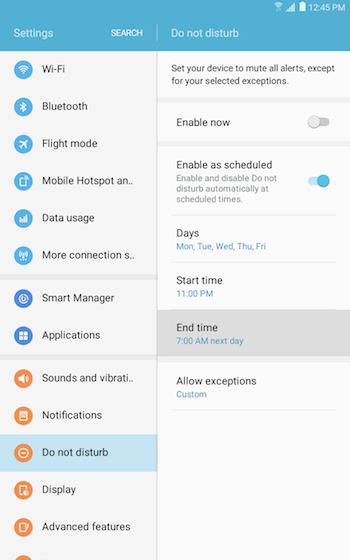 You can set Do not disturb mode to turn on or off automatically at scheduled times. 4. 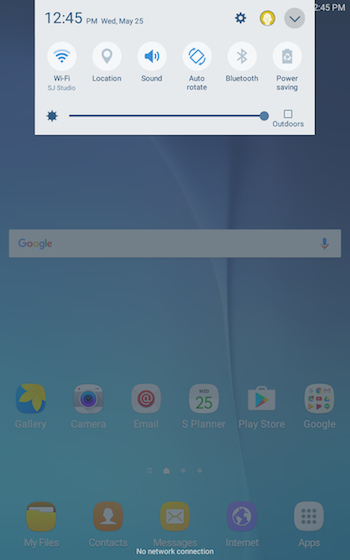 Touch the slider next to Enable as scheduled to turn Do not disturb mode on at scheduled time. 6. 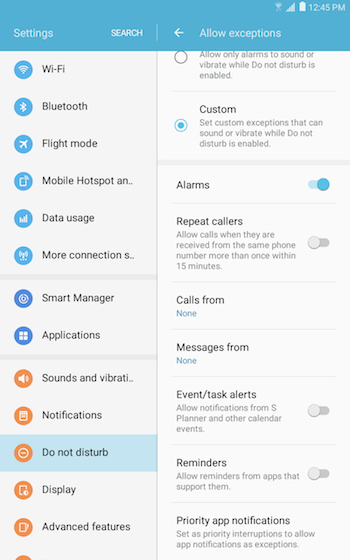 Mark the checkboxes for the days when you want Do not disturb mode to turn on automatically. Then, touch DONE. 8. 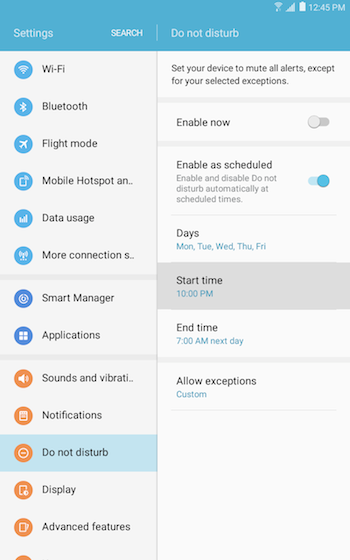 Touch the hour and minute displays and AM or PM to enter the time Do not disturb mode will turn on. Touch DONE when you are set. 10. Touch the hour and minute displays and AM or PM to enter the time Do not disturb mode will turn off. Touch DONE when you are set. 4. 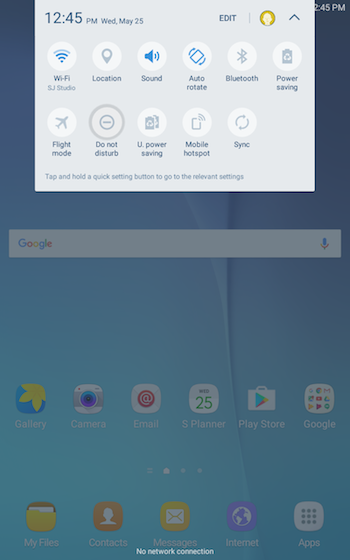 Touch the slider next to Enable now or Enable as scheduled to turn Do not disturb mode off . 2. Touch DISABLE to turn Do not disturb mode off.